This is the memoir of Dr. Dave Williams, an astronaut and former Director of Space and Life Sciences at NASA, who became at various times an ER physician, aquanaut, cancer survivor and hospital CEO. NSS members will experience his adventures via an intimate, detailed, first-hand look. An overarching message of performing your best, living life in the moment, and overcoming failure and adversity provides inspiration for anyone wishing to become an astronaut. Dr. Williams describes his life in three parts. Part I takes the reader from his childhood in rural Canada, learning important lessons of creativity and independence, through his time striving for a PhD in physiology. Part II covers his working in emergency medicine, joining the second class of Canadian astronauts, and graduating from NASA’s Astronaut Candidate (ASCAN) training. 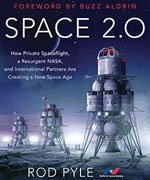 The book describes in Part III what it is like to fly on two missions to outer space. Many small black and white photos, interspersed in the chapters, illustrate key moments in his life, and sixteen pages of color photos are located at the book’s center. Although Part I could have been a boring explanation of growing up in rural Canada, Williams keeps the experiences relevant by interjecting their impact on his later performance as an astronaut. At only thirteen, he acquires his diving certification (inspired by TV shows like Jacques Cousteau and Sea Hunt), and at twenty two his instructor rating (which set him up for later work as a NASA Director, when he institutes utilizing an underwater habitat facility as training for missions to the International Space Station). He describes youthful deeds such as attaching a firecracker to a glider, which of course catches fire in mid-air, and later igniting a neighbor’s shrub with a “rocket powered” toy car. He also includes some astronaut gallows humor: “If you have a problem in outer space, you have the rest of your life to solve it.” But with no Canadian space agency at the time, he pursues a career in medicine when inspired by his mother, a nurse, who teaches him the strict protocols necessary while injecting his father for a vitamin deficiency. In Part II, after he describes his emergency room experiences, Dr. Williams explains attending a “Women in Aviation” conference with his wife Cathy, a flight instructor and later Air Canada captain. There, he meets astronaut Linda Godwin, who informs him the Canadian Space Agency will be recruiting new astronauts. When he applies and is selected as one of four from 5,300 applicants, the chapter describes in detail his subsequent training. Readers experience the feeling of hypoxia in a high-altitude chamber, and then executing the g-strain maneuver in a centrifuge so as not to perform “the funky chicken” from g-LOC (Loss of Consciousness). After his selection as a mission specialist by NASA, the reader follows William’s additional training at Houston, such as what it is like to fly the supersonic T-38 trainer. Upon return to Earth, Dr. Williams embarks on a career as a NASA Director, managing over 1,000 people and focusing on the protocols and equipment needed to care for the crews building the ISS. Although the book spends little time on his management of such an organization, it does delve into his leading the NASA Extreme Environment Mission Operations (NEEMO) visit to the underwater NOAA Aquarius habitat. Here, the reader experiences life as an aquanaut with its similarities and differences to outer space. But after being selected to join the Endeavor STS-118 mission to the ISS, Williams is diagnosed with prostate cancer during the mission’s long flight delay due to the Columbia accident. After recovering from surgery and being cleared to fly, the reader joins him in his exhilarating yet frankly frightening space walk as he hovers over Earth while attached only by his feet to the Canadarm2 during installation of a 1,200-pound gyroscope. NSS members will find a book filled with little moments, such as when the patients at the ER ask him to sign “astronaut” to their casts, or watching Earth turn 360 degrees while on an exercise bike, or simply shooting hoops with his cheerful Down Syndrome son. The book’s message is clear. Every moment is precious, whether on Earth, at work, or in space. 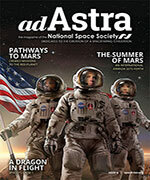 NSS readers should come away with the inspiration to live a lifetime full of experiences, and a better understanding of being an astronaut and soaring above our planet. This review compelled me to get my hands on Dr. Williams’ story. Thank you to Mr. Lee for the inspiration. Thanks for the great review. I hope readers have as much fun reading it as I did writing it! The reviewer has done a terrific job of getting the value of the book across. I feel inspired simply reading his review. I like the way he describes anecdotes in the book, which sound intriguing. Dr. Williams seems like a fascinating high achiever, who also has his priorities in an admirable order.